The best part of the holiday of Thanksgiving is that it reminds us of how blessed we are. It’s important that we stress to our children that God is the source of all that we have and that we should thank Him daily for those blessings. This acorn and leaves hanging project is a perfect way to have the kids state what they are thankful for. 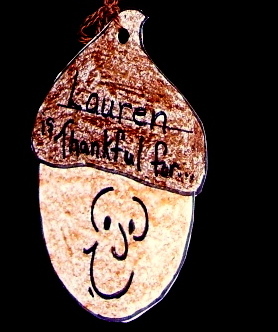 For the pattern and directions go to “Be Thankful,” in the 1st Grade Projects Gallery in the sidebar. This entry was posted in 1st Grade, Thanksgiving and tagged 1st grade, acorn and leaves, be thankful, hanging thanksgiving craft for kids, thankful art, thanksgiving craft, thanksgiving craft for kids, Thanksgiving mobile, thanksgiving project, thanksgiving project for kids. Bookmark the permalink. Thanks for the comment, Pam. I’m so happy to know that teacher’s are finding these projects useful. These are so cute! I love that you have the focus on thanking God! My class will love it!